Hosting the Passover seder is no small task. The ceremonial meal has very strict guidelines that dictate what can be served, what it can be served on and the order in which the meal progresses. Here’s a primer on how to host a Passover seder in your own home. The Haggadah is a crucial part of the Passover seder. It is the text that outlines the order of the seder and tells the story of the Jewish exodus from Egypt. If you are hosting a Passover seder, then you need one book for every person present, as everyone reads it together at the table. You assign someone to lead the reading, typically the eldest person. 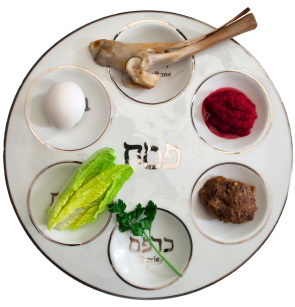 Another vital element, the seder plate holds six symbolic foods that each represent a part of the Passover story. These are maror (bitter herbs, usually horseradish), chazeret (a second bitter herb, typically romaine), charoset (a sweet mixture of apples and walnuts), karpas (usually parsley dipped in salt water), z’roa (shank bone, usually lamb), and beitzah (egg, usually hard-boiled). When the Israelites were freed, they left Egypt in such a hurry that they could not wait for their bread dough to rise. To mark this, observant Jews do not eat any leavened bread during the eight days of Passover. Matzo, which is an unleavened flatbread, is a major symbol of the holiday. Ashkenazi Jews also refrain from eating grains, pulses and legumes. Wine is an integral part of the seder meal (children are served grape juice). Four cups of wine are consumed throughout the course of the seder to celebrate freedom from exile (although often people only take four sips to observe the ruling). While Manischewitz is often served in the US, any kosher wine for Passover will suffice. Observant Jews rid their entire house of chametz, or foods that are not kosher for Passover. Many also use this as an opportunity for spring cleaning, and scrub the house from floor to ceiling. 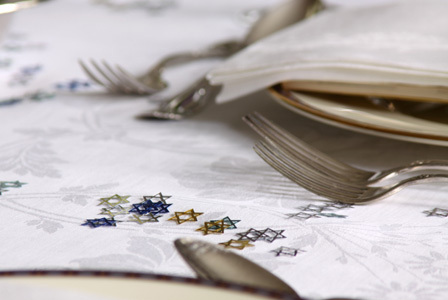 Those hosting the seder must also either have a separate set of dishes and silverware that are used only on Passover, or just make preparations to “kasher” it to make it usable for the holiday (guidelines vary, so consult your rabbi). The meal itself is a joyful and important part of the seder, and preparing for this is much like prepping for any dinner party. Of course, all ingredients must be kosher for Passover, so shop carefully. Popular menu items are gefilte fish, matzo ball soup and brisket.